Closest beach to Phoenix and yet somewhat undiscovered..
A beautiful recently renovated 2 bedroom 2 bath split master plan with California King beds in both bedrooms and a convertible sofa-bed in the living room. Equipped (linens, towels, etc) for up to 6 people comfortably. Beautiful beaches, the charm of Mexico, and the comforts of home! There are activities for the kids, romantic spots for the adults, and other entertaining events that the whole family can enjoy. 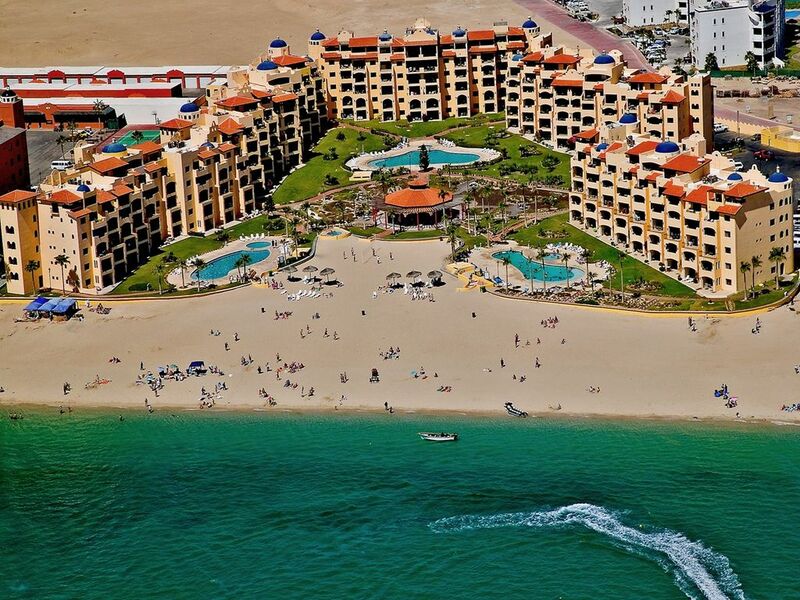 The Princesa is beach living at its finest. You will see the stunning views of paradise right from your balcony, as well as from the kitchen, dining area, living room, and master bedroom! When you look out of your condo you will be viewing the gorgeous Sea of Cortez which is enough reason by itself to visit the Princesa. If you don’t want to walk the extra few feet to the beach there are three large swimming pools, three wading pools for kids, and a hot pool where you can relax and meet other vacationers. There is nothing like putting your feet in the sand on beach though, and this beach is fabulous and it is right there in front of you! There are many activities at the Princesa that will keep the whole family entertained for your entire getaway vacation. If you want peace and quiet it is there. If you want action you can rent a Rhino or Quad and rip around in the desert; or take a flight in an ultra-light; or ride a horse along the beach; or rent some Jet Skis; or go for a ride on a banana boat. It is all there! The resort has a fitness center and swimming pools to keep yourself fit. For those looking for more of a relaxing experience, the beach is always open and is never overcrowded. How about a massage on the beach? This section of the beach is only for resort visitors, so you can count on always having your own piece of the beach to enjoy with your guests. This resort is only a few minutes from the active fishing port of Puerto Penasco, where you can enjoy various restaurants, shops, and clubs with your friends or family. Pick up some shrimp or fish at any of the vendors on the Malecon or around town and grill them on the private grill on your balcony. Awesome!!! This condo is large (1150 sq ft) and features spectacular views. It features two large private bedrooms in a split-master arrangement, each with a California King size bed plus a convertible sofa-bed in the living room. It is set up to accommodate up to 6 comfortably. The primary master bedroom has an en suite full bathroom as well as a view of the ocean. The second bedroom is almost as nice as it is also large and located right next to the second full bathroom that features a walk in shower. The condo has a full kitchen with fridge, microwave, dishwasher, oven/stove; and a laundry room with washer and dryer. Want to chill and watch a movie? There are flat screen TVs in the Living Room and bedrooms and Netflix is live! DVD players too. Need to stay connected? There is a very good Internet service with a dedicated router and WiFi right in the condo. Yes, you can stream a movie! Recent renovations include a full kitchen re-do, all new appliances including washer/dryer, new LED lighting, new fans throughout including the patio/deck, new living room furniture, new beds, stronger WiFi router, Cubie alarm clocks with charging ports for devices, etc. Door access is by a personal door lock code so there are no keys to manage, distribute, carry around, and lose...which also increases security since keys cannot be copied. We Are Canadian Owners and LOVE both Arizona and Puerto Penasco / Rocky Point. We visit the area whenever we can. Quiet and secure yet close enough to the action. The beach is awesome; there is a work out center; there are 3 pools, 1 hot tub and 3 kiddie pools and a restaurant on site. There are many restaurants and a golf course nearby. Shopping at the Malacon for souvenirs or more importantly giant shrimp! Parasailing and jet skiing for the adventurous. Rent a sand rail and blaze around the sand out behind the resorts, climb "Competition Hill", or even just to get around town. Banana boats, massages on the sand, shell hunting, boogie boarding...all of it. For us Canadians the off season of January and February are great too...no snow and highs around room temperature. We also enjoy the authentic nature of the city of Puerto Penasco. Sure, it has been influenced by tourism but just enough to be comfortable and not spoiled like some of the traditional fly-in resort cities. Puerto Penasco (aka Rocky Point) is just big enough to have banks, a Sam's Club, a Walmart (local subsidiary), a Burger King, a few places to get a car fixed, lots of restaurants...but not enough to overshadow the local culture. We provide an information document that tells you everything you need to know about the condo, what to bring, and our own learnings such as favorite restaurants. Beach towels and bathroom linens are provided. 6 full sets of high quality towels, recently replaced. 50" flat screen Smart TV with recliner and pull out sofa. Netflix. Nice big table with 6 chairs. Bluetooth speaker to play your music from your phone or tablet. Fabulous deck overlooking pools, beach and the Sea of Cortez. Unit is on third floor, accessible via elevator. Flat surface entering unit. Walk in showers in both bathrooms. 3 large pools; 3 kiddie pools...one heated in winter. At the pool area...heated throughout the year. You know those brochures from vacation spots showing horse back riding, parasailing, jet skis, etc...except you never see them in action? Well, you do here! On a busy weekend, you can watch ultralights going by, jet skis on the water, kids playing in the pools and on the beach, banana boats going by, horses riding by...all right there! Beach vendors down by the water, but on the other side of a line in the sand so they are not in your face unless you want them to be. Massages right there on the beach! You cannot help but smile! Great place near a great beach and unique town that feels “not discovered” yet. Owners were kind and helpful! Their home was very comfortable and in a great location! Thank you for a nice review Gail! We are very glad you enjoyed our condo and the town. You were a pleasure to host. Please come back any time! Very nice unit. Comfortable seating arrangements. All appliances, dishes, etc. were high quality. The only thing I missed was a jacuzzi, but they were in the process of installing one. Would definitely recommend to others and would rent again. We had a great time staying at Gord's property! The space was very clean and exactly as pictured. The property as a whole was also very nice, however there was only one pool we could use during our stay due to renovations (which we were warned of). The only issue we had was missing a few essential kitchen items that we expected to be there. Thank you for the very nice review Alexandra! I would appreciate it if you would send me a note by email indicating what kitchen items you expected and did not find. We will consider them. We are always looking for opportunities to improve, and maybe others would like those items too. Our family visited Rocky Pt. for the 1st time. The Princesa is a beautiful relaxed resort area. The condo is very nice and well maintained. The views from the 3rd floor are awesome. Waking up each morning looking out over the Sea of Cortez was very relaxing. Sitting out on the patio with a cup of coffee was great way to start the day. Gord is very easy to work with and did a good job having the condo ready for guests. I would recommend staying here to anyone who is thinking about visiting Rocky Pt. Thank you so much for staying with us, and for the very nice review. You were a pleasure to host and welcome back any time! Cheers! Great amenities within the unit, spacious two bedroom with great access to the pool and beach. Beautiful view. Gordon was very responsive and communicative. Would definitely rent this space again! Thank you so much for staying with us, and the very nice review Bridget. You were a pleasure to host and we hope you come back some time. Cheers! The condo was super clean and well-appointed. The furnishings were very comfortable and we loved the view from the deck.